OK, the price chart of SPY is now looking pretty awful. These two charts, however, while clearly reflecting Friday's weakness, are at the same time looking kind of "bottom-ish" if such a word exists. The Moving Average Analysis chart shows a zig-zag of the yellow line above and below the magenta line. Neither line has established new lows recently, hence the "bottom-ish" characterization. The Trending Analysis chart shows a continued decline in the number of stocks in a down-trend. Unfortunately, it also shows that the number of stocks in up-trends has reverted to a relatively low level, and it seems it will be a struggle to increase. This is certainly not a bullish chart but it is still sort of bottom-ish. This next chart shows SPY over the course of the last year. 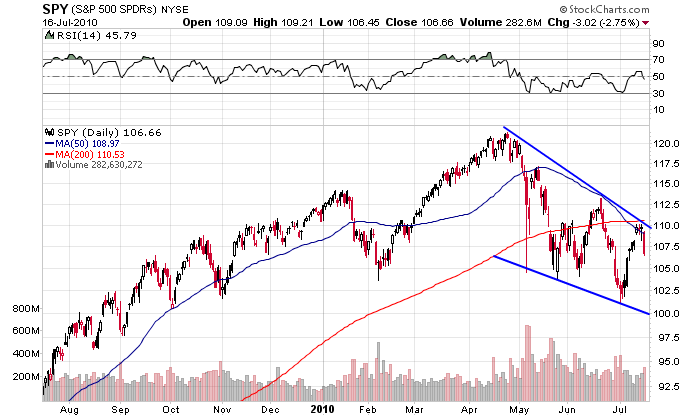 What is highlighted is the downward wedge that the ETF seems to be trapped in. 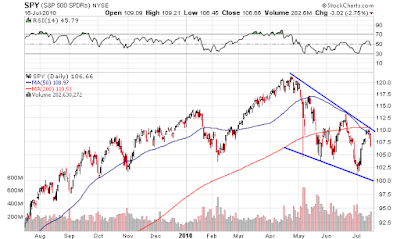 The bulls look at this same chart and say "Hey, isn't a falling wedge a bullish formation?" 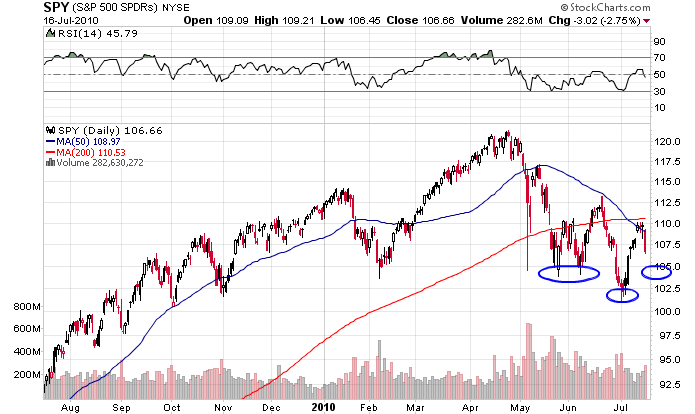 Of course, the answer is Yes only if we finally break out to the upside, something that looks more challenging now that SPY has been rebuffed so soundly at that falling upper trendline shown in the chart above. You can see a potential head-and-shoulders set up. The optimists are OK with a pullback in SPY as long as the ETF fulfills this pattern. Could it happen as the bulls hope? Only time will tell but I thinks earnings will have an impact. There are a good number of bellwether companies reporting this week including IBM (IBM), Texas Instruments (TXN), Johnson & Johnson (JNJ), PepsiCo (PEP), Goldman Sachs (GS), Coca-Cola (KO), Morgan Stanley (MS), AT&T (T), Caterpillar (CAT), UPS (UPS) and Amazon.com (AMZN). If we can get a consistent set of good reports combined with positive outlooks then Friday's market slide might be arrested. In terms of economic reports, the bulls will probably be swimming against the tide. We have a bunch of housing related reports coming up and they are all likely to range from lackluster to awful. These reports include National Homebuilders Association Index, Building Permits, Housing Starts and Existing Home Sales. In addition to the usual weekly jobless claims we will also have the latest report of leading indicators from the Conference Board. The index of leading indicators includes the ten economic statistics listed below. The interest rate spread between 10-year Treasury notes and the federal funds rate. The inflation-adjusted, M2 measure of the money supply. Manufacturers' new orders for consumer goods and materials. The S&P 500 measure of stock prices. The vendor performance component of the NAPM index. The average level of weekly initial claims for unemployment insurance. The University of Michigan index of consumer expectations. Manufacturers' new orders for nondefense capital goods. ECRI, in other words, doesn't directly take into consideration several aspects of manufacturing, consumer expectations or data from the NAPM purchasing manager indexes which until recently were all clearly on the mend. I'd like to think that ECRI underweighted the benefits of the improvements in the manufacturing sector but it's probably a wash now that it seems that manufacturing is showing some slowdown based on last week's Empire State index and the Philadelphia Fed index. So it's clear the two sets of indicators will not track exactly but both will show slowing growth based on the items they have in common. And since both track stock prices, it becomes somewhat of a self fulfilling prophecy that the indicators will decline when stocks do. I'd love to see these two without the impact of stock prices given how volatile and crazy the markets have been lately. So the battle between bulls and bears and between double-dippers and economic optimists continues. Expect the outcome to see-saw back and forth for weeks to come before we see a resolution.